Breverb has been well worth the wait. This is another compelling argument for ‘going algorithmic´ with reverb. Sumptuous sound and supreme ease of use. Glorious visuals. Stable and CPU-friendly. Useful preset library. No separate banks for insert and send effects. Er… nope, that’s it. A few years ago, it would've been easy to assume that algorithm-based digital reverbs faced certain death. Convolution models, which sample real spaces and therefore feel like a natural reverb solution, were suddenly everywhere, and formerly expensive technology was shipping with DAWs as standard. Extra computing power has enabled the real-world use of this system-intensive technology. However, the downside is that the range of editable parameters in a convolution reverb program is more limited. If you want a reverb you can build from scratch, you need a high quality artificial model. 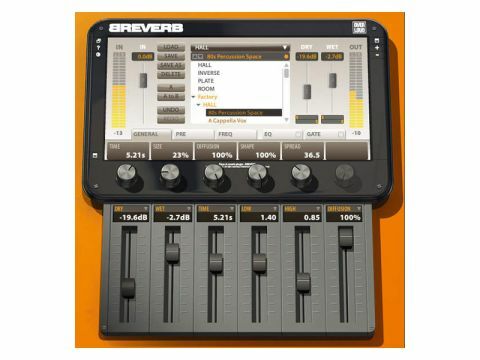 Into this arena, MusicRadar is pleased to welcome Breverb, which lets you shape the reverb of your choice from one of four main algorithms: Hall, Room, Plate and Inverse. Installation is via download and you can buy the plug-in direct from the website. You'll need an iLok key to register the code Overloud sends for authorisation. It can take up to a couple of days to receive this, but Breverb comes with a fully functioning demo to run until the code arrives. Thereafter, Breverb shows up in your plug-in folder for use either in-channel or on an auxiliary bus. The first thing that strikes you is the interface - this is one of the best-looking plug-ins we've seen in ages. The design is seemingly based upon the LARC remote control for the world-renowned Lexicon 480L hardware reverb, with Breverb's GUI offering a main screen below which lie five rotary dials and five sliders. Breverb has a sound to match its sweet appearance. Selecting a starting point for your sound is easy as the plug-in's library of presets has a drop-down menu for each of the reverb algorithms. Clearly labelled key parameters are then spread across the dials and sliders. The effects are of sumptuous quality, with everything from a little drum ambience through to full-on symphony halls. Dedicated EQ and gate pages accompany the more general reverb parameters, with tabs on the main screen granting access to the innermost workings of the sound. From the main screen, you can also try A-B comparisons, undo edits and save anything you like. I/O meters keep you up to speed with levels and you can shrink the interface if it gets in the way. Here, then, is a flexible reverb that sounds every bit as good as it looks. There are no discernable artefacts to be heard and the release tail remains clean, even on the longest reverb times. Breverb is proof that convolution isn't always the answer when it comes to quality reverb.